I've been informed by Jere, A Red Sox Fan In Pinstripe Territory and The (Big) Enchilada devotee, that the implied size in parentheses is out in the open. 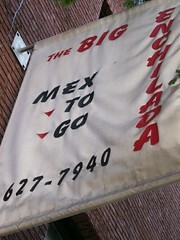 NYC's The Enchilada is now officially known once again as The Big Enchilada. Reportedly, portion sizes have not changed. 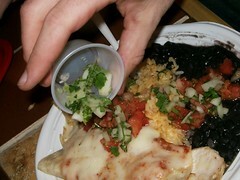 Justin drops some onions y cilantro on an enchilada from The Enchilada. I had a few bites and man, that thing was good. Then our apartment flooded. Seriously. PS: The flood was not caused by any plumbing conflicts related to this meal's consumption. After months searching through New York for a quality burrito, Mr. Daniel Fink came to my assistance by introducing me to The Enchilada. Sadly, it was at the end of my stay. 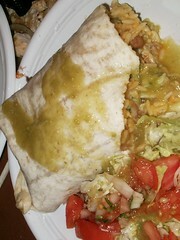 The Enchilada refuses to wrap their burritos in foil, and I was forced to resort to the fork and knife. 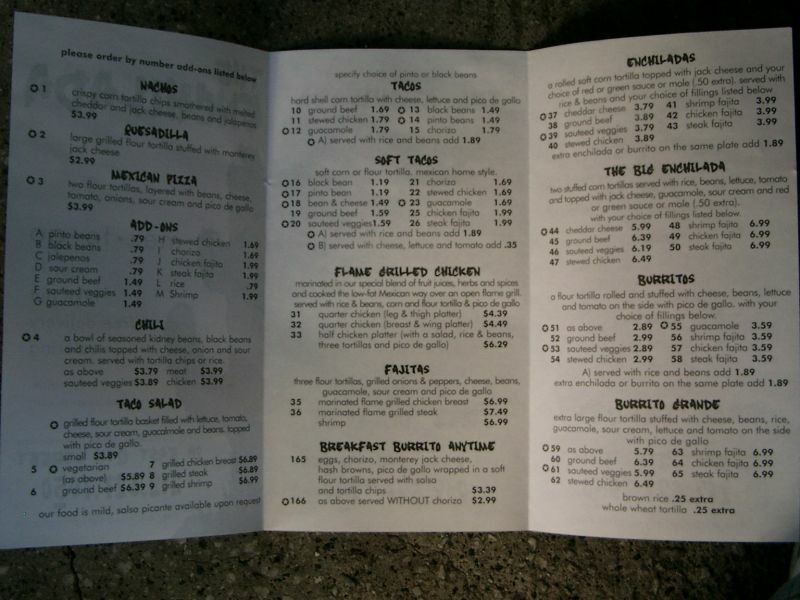 Still, the quality was surpassed only by La Ceiba, which is more of a restaurant than a burrito joint. 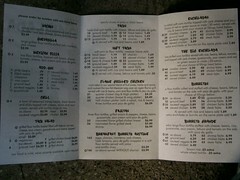 Cosmic Cantina was close, but was edged out by the verde sauce. This The (Big) Enchilada meal was rated: 7.2. 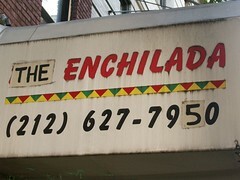 Located in the heart of New York University just outside Union Square (Map), The Enchilada provides low cost Mexican food (by Manhattan standards) at all hours of the night (by non-Manhattan standards). 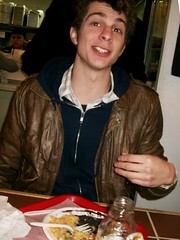 Some time back, they were known as, "The Big Enchilada." Phone books may have both listings. It is unclear if the name change was due to a shift in ownership, trademark infringement, or a reduction in enchilada size.